I strongly believe the world knows that there’s a smartphone war going on today. I still remembered the time when the only strong rival or model in terms to smart devices are those coming from Apple, and the rest are equal on the ground. However, things have changed and the top companies outside Apple are almost greater if not equal to the said competitor, having their own flagships ready to soar the ocean of guts. Among these companies are Samsung, Sony, and HTC. The release of the Samsung Galaxy S4 was said to be phenomenal because of the tons of features, the latest specs, and of course, the looks. Known for its Super AMOLED display, which, though not up to par with Apple’s Retina display, is so good, almost everyone at that time wanted it on every device they bring. However, it’s admissive to learn that not everybody loves the brand itself, hence other companies star in this matter. HTC, on one side, is said to be good for a very rich user experience and a lovely interface, while Sony excels on multimedia experience and gaming offers because of the reputed PlayStation brand. 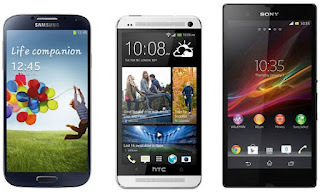 Today, I am going to reveal to you the possible truths to help you decide which would be the best iPhone 5 (or iPhone 6) killer among Samsung Galaxy S4, Sony Xperia Z, and HTC One. Enjoy reading along, as I have categorized the comparison for your convenience and reference. The brand, for me, is the biggest thing to consider when comparing between products. Brands are usually reputed based on years of experience and expertise, user experience and feedback, product identity, manner of advertisements, and even remarkable people and stores. Samsung, firstly, gains the trust by being a highly reputed electronics manufacturer based in Korea. Samsung has been existent for decades now, and while they did not start as a cellphone manufacturer, they were already good for appliances especially TVs. Their entry to the world of mobile phones started very well also, and their growth is never to be questioned. HTC, on the other hand, started in 1998 and was among the first ones to introduce wireless handheld devices and even the touch-enabled ones. Being based in Taiwan, its growth together with their products was not really widely known especially to the western countries. Also, part of their start was associated with their Windows products, which later expanded to Android and other systems. The success of Sony, ultimately, started during World War II when the founders started a radio repair shop. Interestingly, for all these decades, the growth of the company may seem to be slow and ‘draggy,’ meaning, they tend to develop based only on available technologies. However, this must not distract you because of how reliable their products are which include the famous PlayStation. Today, Sony owns a wide selection of multimedia networks across the globe, and continues to excel in providing quality consumer electronic devices. Form comes in next to brand because this is the most picturesque factor to identifying a business or brand. Form can be considered and studied based on aesthetics, build quality, materials, ease of use, and even physical metrics. At only 7.9mm thick, Samsung gains a very respectable body in its new S4 model. Moreover, for such a depth, and in relation to its 5-inch display, the Samsung Galaxy S4 wins the prize of being the one to cater the smallest body for a big screen. The S4 also weighs 130 grams for its 136.6mmx69.8mm body, making it also win as the lightest smartphone for a 5-inch display. The S4 also features almost bezel-less display, and though limited in color availability, is built with fine metal materials. The HTC One, on the other hand, weighs a little further at 143 grams, but is the thickest of the three at 9.3mm. Measuring 137.4x68.2mm, the HTC One is a little narrower but slightly taller than the S4. Sony’s Xperia Z is but the sleekest smartphone design at least for me, and its metrics lies in between the other two at 7.9mm thin but the tallest at 139mm. The Xperia Z is also the heaviest among the three at 146 grams, but at least, it features a water-resistant body and a very premium build. The aesthetics can be hardly equated because it is too subjective. But based on my comparison, both HTC One and Xperia Z have a design much reminiscent of the iPhone 5. The Galaxy S4, nevertheless, has the most unique design among the three., though you might want to know that the Xperia Z has a glass body. This is usually noted as the ‘crowning glory’ of devices especially smartphones. The display factor is usually contrasted based on resolution, pixel density, brightness, color reproduction, viewing angle, and material used. The Galaxy S4 features a Full HD (1920x1080p) Super AMOLED Display. At 441 pixels per inch for the density plus the coveted AMOLED display, the S4 produces a very vivid representation of data, up to its almost-edge-to-edge screen. Being Super AMOLED, the S4 also has the richest color representation among the three, though such ‘richness’ may still be subjective as a lot according to my reviews have said the colors are somewhat overly saturated if not too vibrant. Being a 5-incher also, the Xperia Z is said to have the world’s sharpest display. Though still at full HD for the resolution and with a pixel density of 443ppi, the Xperia Z features a display product right from the highly respected BRAVIA Engine of Sony’s line of TVs, making colors more vivid and brighter than expected. Lastly, there’s also the OptiContrast and Direct Touch technology, making blacks truly black and contents live up to the surface. Samsung Galaxy S4: Dual Shot, Group Play, Sound & Shot, Story Album, Drama Shot, Samsung Hub, S-Translator, ChatON, SmartPause, AirView/AirGesture, Samsung WatchON, HomeSync, S Health, Adapt Display, Adapt Sound. HTC One: BlinkFeed, Dual Frontal Speakers, HTC UltraPixel camera, HTC BoomSound, HTC Video Highlights. HTC Sense TV, HTC Sense Voice. Sony Xperia Z: HDR Videos, IP55 & IP57 rating for dust and water resistance, glass fibre polyamide, One-touch (NFC), STAMINA mode for Battery, MH-EX300AP headset, Xperia Care, Exmor RS for camera, SmartTags, Sony Media Apps (Walkman, Album, Movies, PlayStation Mobile). This category includes system information, the CPU and GPU for processing tasks and apps including games, the RAM for multi-tasking, storage, other noticeable hardware parts such as camera, battery life, and connectivity. The Samsung Galaxy S4, being a bit later in release and announcement, is expectedly having the biggest and the most stable specs so far. The S4 comes with an Exynos 5410 Octa 1.6GHz processor (two quad-core processors), PowerVR SGX544MP3 for the GPU, 2GB of RAM, 16-64GB of internal storage (expandable up to another 64GB), 13MP camera (LED Flash, AF, HDR, dual shot) and 2MP front camera, dual-band Wi-Fi, DLNA, Wi-Fi Direct, Hotspot, BT 4.0 (with A2DP and EDR), 4G LTE, mono speakers only, and NFC. The Samsung Galaxy S4 is loaded with 2600mAh battery and utilizes Android Jelly Bean 4.2.2, the latest and the most stable version of Android so far. Probably the first among the three to have been released, the HTC One is not short with the good specs as well. While only using Android 4.1.2 Jelly Bean, the One has a Qualcomm Snapdragon quad core processor at 1.7GHz, an Adreno 320 GPU, same 2GB of RAM, internal storage starts at 32GB, no SD card expandability, 4MP Main Camera (AF, LED Flash, HDR, IS, dual shot), 2.1MP front camera with HDR, dual-band Wi-Fi with Wi-Fi Direct, DLNA, Hotspot, BT 4.0 with A2DP, 4G LTE (market dependent), NFC, dual stereo speakers, and the lowest battery capacity at only 2300mAh. The Xperia Z of Sony boasts of its display as the top hardware it features, followed by the said durable body construction. The Xperia Z has a quad-core Qualcomm APQ8064 processor clocking at 1.5GHz, the same Adreno 320 for the GPU, 2GB of RAM, standard 16GB of internal storage (up to 32GB expandability), 13MP Camera (AF, LED Flash, HDR, IS, continuous AF, video light, dual shot), 2.2MP front camera, 2330mAh battery, Wi-Fi with Wi-Fi Direct, DLNA, hotspot, BT 4.0 with A2DP, 4G LTE, NFC, mono speakers, and an Android 4.1.2 platform. All of the three devices we tackled today come with decent build quality, while the Xperia Z makes the clear distinction because of a fully laminated display to a weather-sealed body. As for the aesthetics, the Samsung Galaxy S4 wins in being uniquely designed, while the beauty of the other devices is inevitable as well. The winner in terms to display can be hard to identify as well, but all of them feature full HD resolutions and superb pixel density. 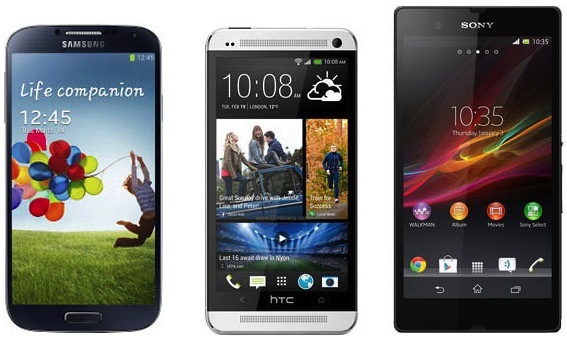 However, the HTC One has the least features for the display when compared to the other two. For the features, the Samsung Galaxy S4 takes the crown for being an all-around smartphone that even caters to the healthy side of the users. Samsung also has a lot of features that interacts very well with the users such as enhanced gestures and eye-detections. On the other hand, HTC gains strength on the One’s dual stereo speakers, making it a star when listening to music, though Sony still takes the medal for being the best multimedia device among the three. HTC’s One also takes advantage of its ‘Sense’ features, though this may not be a parallel to the package offered by the S4. For the specs, clearly the Samsung Galaxy S4 has all the modern hardware specs making it a ‘prototype’ for the next generation of smartphones. However, the other two competitors take their own gain in terms to camera and multimedia experience such as the speakers and microphones. The S4 also has been reported to have the ‘best gaming experience’ based on some surveys, but the Xperia Z takes the advantage of being more TV-friendly. Perhaps for the hardware, the biggest losing point goes to HTC One particularly because it does not have an expandable storage. What kind of review is this ? S4 design is the most unique device? the S4 is the most feature filled one of the bunch. its a tough one, the Z is probably the best looking one with the nices OS (for me) but the "lack of power" is a downer for me. the S4 has everything i would want in a phone, plus about 8million features i dont want. however, if it were me, i would still buy it. but i would probably Rip everything touchwiz on the phone out of it. i find touchwiz very Ugly, and intrusive, and bloated. i mean you get about 9GB of storage out of 16.....thats rediculous. take all that crap out of there, throw on stock android, and the phone would be simply stunning. Samsung galaxy note philippines is a amazing phone it is too fast and it plays hd videos so better and hd games it also support its battery backup is so good please u also buy this phone it is so good than htc or nokia.